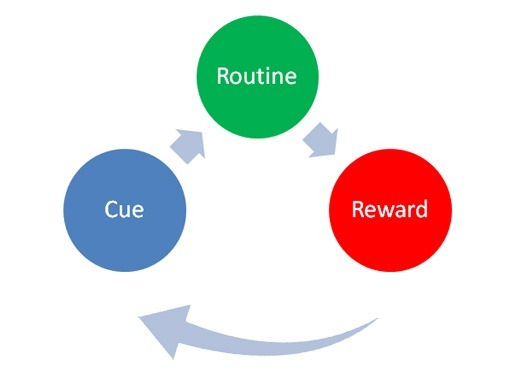 To change a bad habit, you simply keep the old cue, and the old reward, but change the routine. In his book, The Power of Habit, author Charles Duhigg describes how he changed a rather bothersome habit into a better one. He discovered that he was routinely getting up from his desk at 3:30 in the afternoon and going to the cafeteria and buying a large cookie and then chatting with people at the cash register for a few minutes before returning to his desk. This had become an everyday event and he started to notice that he was gaining weight. To change a bad habit, he needs to know the three elements. He needed to identify the routine of the habit loop, know what the cue was, and also pinpoint the reward he was getting. So he did a little research. First he had to identify and write down the routine that he was experiencing. Routine: I get up from my desk in the afternoon, walk to the cafeteria, buy a chocolate chip cookie and eat it while chatting with friends. Now that he had the routine written down, he needed to figure out the cue and reward. In this case it was good to work backwards. First he needed to isolate the reward he was getting. Through trial and error he needed to figure out if the reward was the cookie or the interaction with the people at the cash register. The best way to do this was to vary the reward. 1. He walked around the block instead of going to the cafeteria. 2. He got a cup of coffee and went back to his desk. 3. He went to the cafeteria, bought an apple, and ate it with friends. 4. He got up and went to a friends cubicle and chatted for a few minutes. In his experimentation, Charles discovered that it was a conversation that he craved. Now he needed to know what the cue was. Researchers have found that almost all habit related cues fit into one of five categories. Charles wrote down answers to these questions for a few days. He soon realized that the cue was an urge to get a snack at a certain time of day. So in his case, he modified the routine by visiting friends at their cubicle for a few minutes each afternoon, instead of going to the cafeteria and having a cookie. After a few weeks of the modified routine, it became a habit and Charles lost about 12 pounds in the process.